Stretching the One Income Dollar: Interested in Trying Cream of Wheat Canada's New Cinnamon Swirl ? Interested in Trying Cream of Wheat Canada's New Cinnamon Swirl ? Cream of Wheat Canada has made 5,000 samples of Cinnamon Swirl packets available, and would love for their loyal Canadian fans to have the opportunity to try this delicious new flavor. We've tried it and know it's tasty but you want to try it too don't you?? The Free Sample is now available! 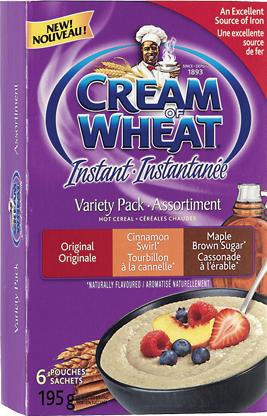 Please note: Cream of Wheat Canada only has a total of 5,000 samples to offer their Canadian fans. If some of you are unable to request one, a $1 Cream of Wheat Coupon is also available on their site and can be used towards the purchase of any Cream of Wheat hot cereal.